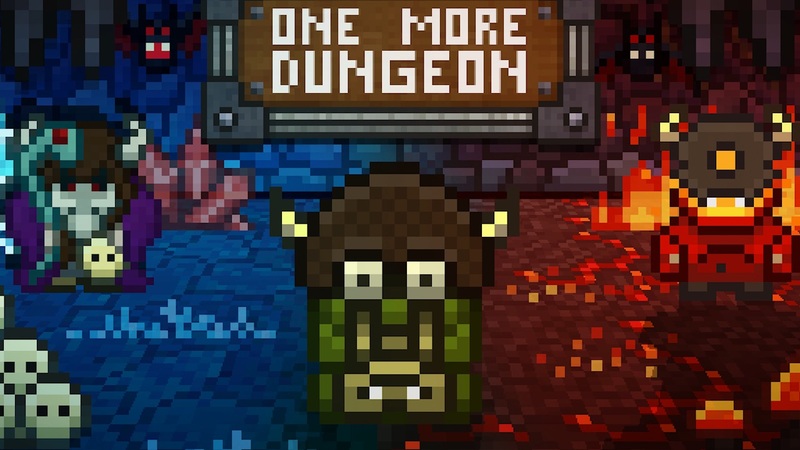 Whether it be in adventure, roguelike, or role-playing games, we have had the chance to spend many hours in dungeons on Nintendo Switch this past year. Ratalaika Games and Stately Snail are hoping that you haven’t grown bored of darkened, intertwining corridors just yet, with One More Dungeon happily throwing you into procedurally-generated levels in which you must save the world. Your character is a nameless adventure seeker, who, while the game never takes the time to explain, must reach the final level deep within the dungeon that you find yourself in. It is there that you will destroy the obelisks that are being used by forces of evil to invade our world. With a dagger in one hand and a magic staff in the other, you nervously explore a dungeon that has been built with an almost voxel-based art style that Minecraft helped popularise. But, with some pixel art direction, it won’t take long for the game’s colourful presentation to capture you with its charm. Just as the narrative is never discussed in any depth, neither is anything else in One More Dungeon. That can make your early time with the game feel particularly awkward, as you press each button in looking to learn what each of them does. This is an early slip up for sure, with the only hint that the developer immediately gives explaining that you must seek out and kill the level guardian to retrieve a seal. This will open the passage to the next dungeon floor, and, as some small help, it adds how the level map (Y Button) and your inventory (X Button) can be accessed. I will never understand why developer’s don’t choose to at least teach you the basics, but, after playing around with the controls, you will soon come to realise how to fling magical projectiles (L Button) and stab anything that moves with your dagger (R Button). Interactions such as opening chests or picking up items are left to the A Button, and then the directional, ZL, and ZR buttons are assigned to any potions or items that you pick up on your adventure (which I realised after accidentally gulping one) that are listed along the top of the screen. Phew. It probably doesn’t sound that problematic reading this, but, in the moment, it means that your time with One More Dungeon gets off to a bad start. It doesn’t help that the game feels clunky, an impression that I was never able to shrug off as I wandered between rooms stabbing bats stuck in webs, ravenous rats, and whatever else the game decided to shove in my general direction. None are particularly troublesome to eradicate, but they can chip away at your health to soon see your adventure cut short. It is the mutators that present the chance to customise the gameplay to match your playstyle, the game’s one saving grace that plays to its roguelike aspirations. These can be bought and activated with points that have been accumulated on a previous run and can ease the experience by halving enemy health, increase your maximum health level straight away, increase the size of the levels, or throw in more enemies, among others. Handing you control over such gameplay modifiers is a smart move, and, especially for those that are looking to spend longer sessions with One More Dungeon, make sure that you can up the ante whenever you want to heighten the challenge. There are achievements to hunt down and unlock which incentivises your time with the game, which have presumably been carried across from the Steam version. But, in speaking to the broader issue that I found with One More Dungeon, I never really felt entertained nor engaged by the experience. The idea to fuse old-school first-person shooter and roguelike genres is sound, but the developer perhaps needed more time and player feedback to refine their vision. As it stands, we’re left with a game that is packed with enough character but lacks an addictive enough gameplay loop to keep you hooked.